I recently accompanied my wife and four other sanshin players from Hawaii, along with their sensei, to Okinawa to take part in the annual testing event for sanshin certification. The sanshin has developed into a high level musical art, and there are five skill levels to pass on the way to becoming a master. Each level normally takes years of practice to learn well enough to pass the exam. The beginning level is called Shinjin Sho. My wife Yukiko and the other Hawaii students were all testing for the first level. It was quite an exciting experience. I’ll tell you the outcome in a bit, but first here is some background on the sanshin. If any single musical instrument can truly be called Okinawan, it is the sanshin. It is a three-stringed banjo-type instrument brought in originally from China some 600 years ago, during the height of Okinawan-Chinese cultural exchange. The Chinese instrument was called the sanxian. The word “sanshin” literally translates in Japanese as “three strings”. The old Ryukyu kingdom adopted the sanshin as part of its musical repertoire and developed it into a high level of artistry. It is found in both classical music (koten) and folk music (minyo). 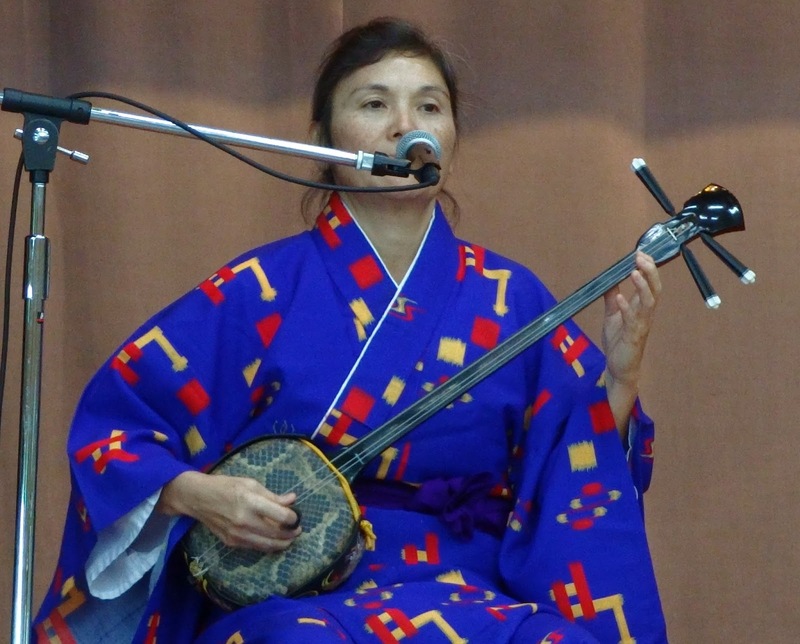 Modern Okinawan performers use the sanshin with or without modern western musical accompaniment to sing new generation songs. Similar to how the ukulele has become attached to Hawaii and Hawaiian music, the sanshin is a key cornerstone of the Okinawan music scene. The sanshin is made as follows: the neck is made of a single piece of hard wood, the sound box is covered in snakeskin or a synthetic skin, and it has three strings, usually made of nylon. There are no frets. The large protruding tuning pegs for the strings are called karakui. It has a removable bridge or uma. The strings are plucked in traditional style with a bachi, which in the old days was made from a water buffalo horn, but today can be made from ceramic or some other substance. Of course modern players also use a guitar pick or their fingers to play the notes. The sanshin is often confused with the Japanese shamisen. 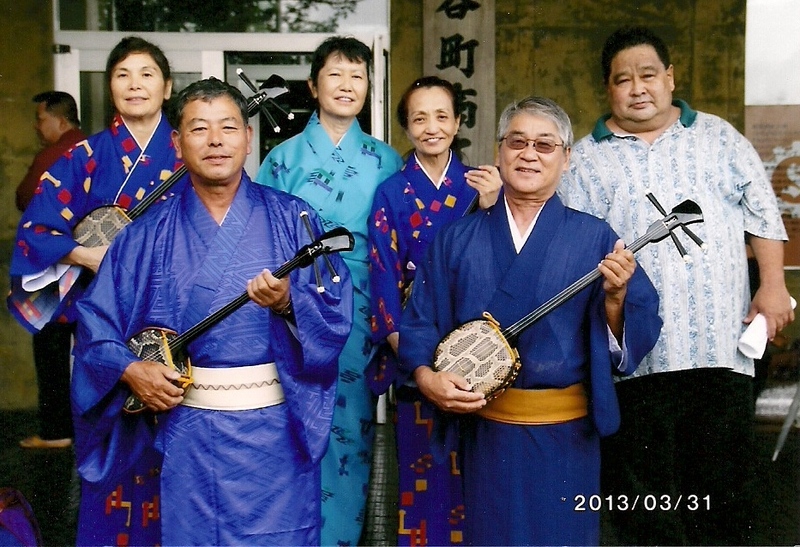 Many people refer to the sanshin as a shamisen, but actually the shamisen is a derivative of the Okinawan sanshin, which made its way to Japan in the 16th century, many years after gaining widespread popularity in Okinawa. Compared to the Okinawan sanshin, the Japanese shamisen is longer and has a larger body. Both have three strings. The shamisen typically uses cat skin to cover the body rather than snakeskin. The koten or classical music style was played to royalty and visitors to the royal court as part of formal ceremonies. The minyo or folk style is livelier and is played throughout the country by just about everyone. To give you an idea of what I mean, first of all, there are minyo bars everywhere, it seems. At least in Koza (Okinawa City) and Naha, they were plentiful. They typically serve drinks and some bar food (Okinawan of course). Each bar has a stage area with a sanshin, taiko drum, and a microphone. Usually the proprietor will give a 30 minute performance, and perhaps an encore with some encouragement. Then it becomes “open mic” night, and everyone in the crowd so inclined can come up and play and sing their favorite minyo song. Others in the crowd may sing along, or if it’s lively enough, get up and start dancing. Great fun. The action doesn’t usually get started until after 10pm and can go well past midnight. In Ishigaki, which we also visited, Our tour guide at one point pulled out a sanshin and started playing and singing for us. Later in Taketomi, the ox cart driver also grabbed a sanshin from a shelf above him and entertained us as well. I never investigated, but would not be surprised to find out that our taxi drivers had sanshins in their cars ready for a chance to play. Many stores in Okinawa sell sanshins whether they are music stores or not. The venue for the exam was an auditorium with a stage where the testers perform one at a time. They face a line of 10 to 12 judges from different schools. A large crowd sits behind the judges. Pressure! Each student is called out by the number they drew at random prior to the testing. They bow, and have a choice of sitting in a chair, sitting seiza style on the floor, or standing. The test song for every level involves both singing as well as sanshin playing. Although it is a test for sanshin, your ability to sing is just as important. Any gross mistake or uncalled for repetition gets the performer the sound of a loud buzzer (really!) and they fail. For the higher level students, the crowd also gets involved. If a student makes a mistake or stumbles during his performance, the audience grows unruly and makes lots of loud grumbling noises. This of course often unnerves the person who is testing as he or she keeps playing, trying to recover and finish. Often however, the crowd noise affects them and causes them to make a mistake so bad that they get the deadly buzzer from the judge. Talk about tough love! For this year’s test, there were about 40 students who tested for first level Shinjin Sho. The Hawaii contingent brought five people to test. The happy ending is that all five of the Hawaii students passed! Needless to say we celebrated this event in various ways, including some minyo bar festivities, of course.